Always use the Main Menu whenever you want to do anything other than combat with your PC. All communications, (scrolls, telepathys, knowledge) are accessed from the Messages & Information Menu. Any critical Keys found, are added to the Realm Keys Acquired Menu. All objectives are added to the Journal. Most of the time, the other menus are for information only and are there for a player to understand at what level their PC's are and where they may need to develop them with Soul Fragments at Soul Forges. The only other exceptions, are the extra menus that appear for PCs that have extra skills or abilities to use outside of combat, like Restore or Sustain for weapons, or Soul Magik for those with the ability to cast soul spells. In fact, a player can ignore all menu information until they have a need to check something like a scroll found, or if they need to remind themselves what their immediate objective is. If ever in doubt of what to do, the first place to look in is the journal. A) If a player carries 5 or more Soul Fragments, then they will be reborn with full HPs at a slightly earlier safe location at the cost of 5 Soul Fragments. 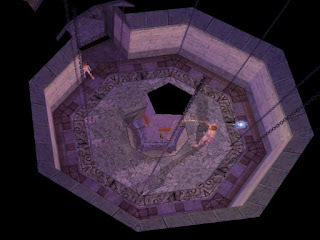 B) If the player does not carry enough Soul Fragments, then their souls are left at the same location as they are dispersed and they must wait until Soul Fragments fall upon them at which time they are reborn. Alternatively, if another PC carries a Soul Gem, then the PC can (at the sacrifice of a few of their own Soul Fragments) bring the PC back into existence. The PC is reborn with only a basic few HPs in both circumstances. A) If a player carries at least 10 Spirit Fragments, then they will be reborn at the area's Soul regenerator. They will only be reborn with a basic few HPs. B) If the PC does not carry enough Spirit Fragments to use the Soul Regenerator, but does have enough Soul Fragments to be reborn at an earlier location (like A above), then they will do so. C) If the player does not carry enough Soul Fragments or Spirit Fragments, then their souls are left at the same location as they are dispersed and must wait until Soul Fragments fall upon them at which time they are reborn. Alternatively, if another PC carries a Soul Gem, then the PC can (at the sacrifice of a few of their own Soul Fragments) bring the PC back into existence. The PC is reborn with only a basic few HPs in both circumstances. Note that (B) in the first option is the same as (C) in the second option, and that while losing 10 Spirit Fragments is not too much to pay for a rebirth, losing 5 Soul Fragments is quite a penalty and is why a player must be careful that they do not put their PC in a position where they have stockpiled a number of Soul Fragments and may die. The best advise, is always be sure to have used Soul Fragments as early as possible and carry no more than 4 if you have not yet turned on a Soul regenerator for the area. However, the advantage of being brought back by a Soul Gem (if achieved), is that the PC does not have the dispersal count against them at the final XP award for the module. The risk and option is left to the players to decide. "The heroes walked across the hallway to the nearby elevator. This was their prime goal anyway and so the heroes looked for the control that would send them to the courtyard level as Terrell had suggested. There were many apparent levels to this large building, but one was clearly marked as the Ground Floor. When Karasten pulled the lever, however, it was obvious that the mechanism was jammed." Read More here.